Buy from a trusted seller with flawless feedback and fast shipping. My feedback speaks for itself. Comes from a smoke free/pet free home. Please check all pictures and ask any questions before purchasing. Make sure to check out my other items for sale and to follow me as a seller as I am adding new items daily. Any questions or other photos needed please don't hesitate to ask. Thanks for checking out my page! 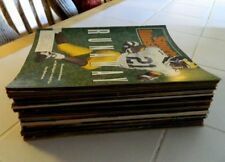 Larry Bird ~ 2 Sports Illustrated Issues ~ December 1989 & March 1992 & a Bonus! Two (2) Larry Bird. Dec. 11, 1989 ~ "What's Wrong Larry?". Mar. 23, 1992 ~ "Life After Larry". Sports Illustrated Issues. Larry Bird Sports Illustrated 1979 Cover Indiana State! 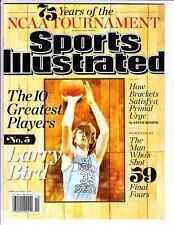 Larry Bird Sports Illustrated 1979 Cover Indiana State!. Shipped with USPS First Class Package. This magazine is in excellent condition. There is a label mark. All my magazines range from VG to Mint Condition. No Exceptions! A SI dated March 23, 1992 featuring Larry Bird on the cover. Get it graded and it will grade out between 9.4 and 9.8. It has the insert inside. Unopened and unread. Bought in 1992 and put away in a plastic holder. Larry Bird. May 2 1983 Sports Illustrated Magazine. It was the first magazine with circulation over one million to win the National Magazine Award for General Excellence twice. You are buying a March 26, 1979 Larry Bird Indiana State Sycamores Sports Illustrated. Bird is struggling, and so are the Celtics. WHAT'S WRONG, LARRY?. SPORTS ILLUSTRATED. Issues December 11, 1989.
sports illustrated Larry Bird Nov 1981. Shipped with USPS First Class Package. Cover: Larry Bird Burns Atlanta in the Playoffs - Boston Battles Ahead. May 2, 1983. Sports Illustrated. Dec. 11,1989 issue of Sports Illustrated magazine in MINT condition, featuring Larry Bird of the Boston Celtics. See scan for details. This Collector's Edition of BIRD A BASKETBALL LEGEND 1993. If you could find one that is in MINT condition it would be rare. Label removed very cleanly, can almost pass as newsstand. All Sports Illustrateds are in excellent to better condition. As always, free shipping! Buy from a trusted seller with flawless feedback and fast shipping. My feedback speaks for itself. Comes from a smoke free/pet free home. Please check all pictures and ask any questions before purchasing. Make sure to check out my other items for sale and to follow me as a seller as I am adding new items daily. Any questions or other photos needed please don't hesitate to ask. Thanks for checking out my page! Two basketball digest magazines Larry Bird on cover of both. November 1981 and November 1987. 87 is in excellent condition 81 is in good to very good condition see photos you decide. Larry Bird On The Cover. You just bought it at the newsstand last week and picked out the best copy available. I will use this as a guideline to my mags. Excellent - Exactly what you'd think: Average. age toning to the inside pages. Has been read. Creasing and wear on the front. LARRY BIRD. Issue March 1984. ALL-STAR SPORTS. Newsstand Copy w/bar code. Don't wait! Get this issue by. 1 RARE 22K EDITION. -FEATURING LARRY BIRD. THIS DECISION WILL BE MADE AT OUR DISCRETION BASED ON YOUR LOCATION. QUANTITY OF 12 AVAILABLE. LARRY BIRD HOBBY EDITION #42 VOL. 6, #1 JAN/FEB 1993. 5, #5 SEP/OCT 1992. MAGIC JOHNSON HOBBY EDITION #29 VOL. 5, #2 MAR/APR 1992. This is a March 1980 Sport Magazine with cover photograph of Boston Celtics Larry Bird.